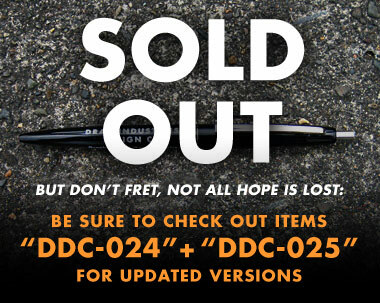 Draplin Design Co.: DDC-011 "Adventures In Plastics Clic Pen"
Remember hearing about the pens NASA developed for their astronauts to write upside down in space? Well, forget that cuz these don’t compare in the least. They are dumb “clic pens” and that’s putting it nicely. Got more questions about the technology within this valuable instrument? This primer might soothe that apprehension some. Maybe not. We don’t care either way. Small parts for small kids to choke on. Lots of fun. Simple design. 03. Use it to make a gun. Just like in 3rd grade, man. 06. Make a rocket out of this one and explore the far reaches of the cold, lifeless cosmos. 07. Go to prison, get in with the bad crowd and make a tattoo gun out of the goddamned thing. 08. Do something with yer life, already.